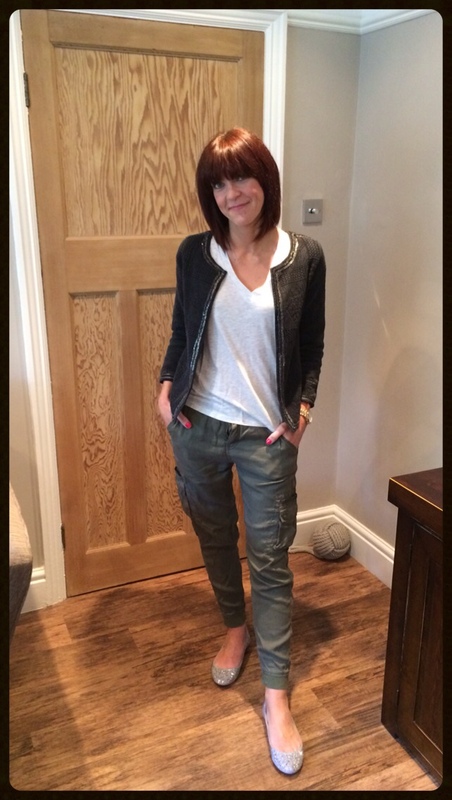 Okay so today I'm starting to look at something I consider my wardrobe to be lacking! Yes it's true I have a dress sized hole!!! Okay so I know I have dresses but last year's glorious summer taught me that I could actually do with a few more & seeing as we're currently enjoying a glorious spell it's got me thinking that there's nothing easier than just reaching for a dress & throwing it on. Great for teaming with some simple sandals or wedges if you want a heel & for a morning while we're waiting for the temperatures to rise great for wearing under a denim jacket too. So first up is this stunning striped jersey dress from Mint Velvet. A real classic that you just know you'll be able to bring out year after year & is never going to date. This would look stunning teamed with some tan flats & either a denim jacket or casual styled classic blazer. Or for those of you that have embraced the trend some leopard print skater shoes, as after all who doesn't love leopard print & stripes when teamed together. 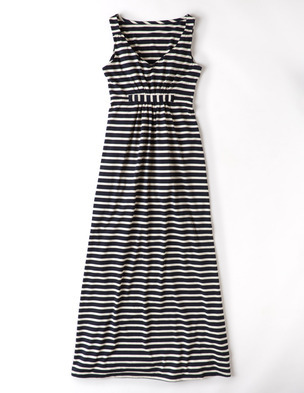 Next up is this simple striped dress from Zara. Now I know from the picture this looks a little on the short side but I'm guessing they're using a super tall model & that on us mere mortals the dress would actually seem a little more on the decent side!!! This next Zara dress I 'may' have ordered & is a prime example of not being put off by the length on the model as I can vouch that this dress does fall slightly longer on me & I'm 5'7". Yes it's still relatively short but not (or at least I hope it's not) indecently or age inappropriately so!!! I love the extra detailing on this dress with the navy panelling down the sides & the gold buttons across the shoulders. Plus it's a great thick material meaning I'm not going to have to worry about it becoming see-through in the sun. 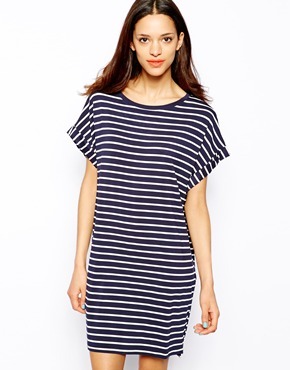 Another classic is this striped ponte dress from Mango, which looks a great length for anyone looking for something a little longer & the cap sleeves are just perfect for covering the tops of the arms PLUS it has pockets too!!! What more could you want?!!! Moving onto maxi dresses now & I love the look of this one from Next, not your traditional striped dress in terms of pattern but a great dress not only for summer holidays but also for layering with a denim jacket on our cooler days. I'm also loving the look of this halter neck striped dress also from Next, but personally I think it would look better without the Angelina pose!!! Totally love the colours with this next dress & the coral teamed with navy. A great dress for work as well as play. Back to shorter dresses now & for the money this one from Pull & Bear looks fab & would make a great beach to bar kind of dress for anyone wanting to rock a stripe while on holiday. 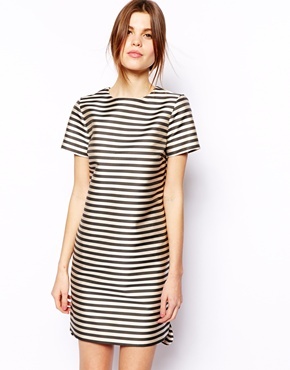 Moving onto ASOS now & I really love this wide striped dress, in particular the neckline, which I reckon would be extremely flattering. If you're looking for more of a smarter dress then I don't think you'll find a better version than this structured shift dress. Which could so easily be worn for the office with a classic blazer - navy, red or yellow would all look stunning not to mention cream. But could also be dressed down with some metallic pumps for a more casual vibe too. Totally loving this wrap front maxi from ASOS. I'm a real sucker for cross over tops as I think they can be hugely flattering & how stunning does the dress look when teamed with yellow sandals?! If however, you fancy a strapless dress then this classic bandeau Jack Wills one should be perfect. I'd quite like to see it teamed with either a leopard print or coloured belt to add a bit more interest. 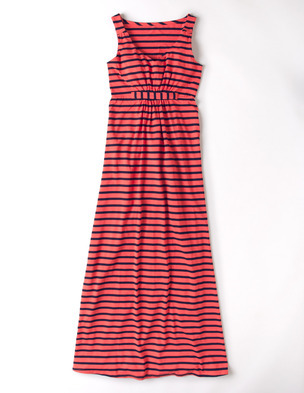 Finally I'm also loving this maxi dress from Boden, again a great classic that will last you years. My only problem is that I love the navy & white classic combo as well as the red & navy version too!! Finally here's what I'm wearing today.....well until I can do some horizontal sun worshipping that is but I thought I wouldn't put you off your Sunday lunch & share that outfit with you!!!! So are you a lover of a striped dress or two?!!! Perhaps like me you have a striped dress hole in your wardrobe? If so I'd love to hear if there's any here that have taken you fancy. Personally I'm thinking that striped dresses are a little like breton tops - in that you can never ever have enough in your wardrobe (note the husband's twitch has now developed to a full on jerk after I declared these words of wisdom, think I better end there!!!!). Have a great day, enjoy the sunshine & the rest of the weekend & I'll see you in the morning. My obsession for anything striped is getting out of hand! Lol Fiona I know what you mean!!! Mine too! I love so many of these dresses. You can't beat a stripe or two Athena ;-) Well that's my new motto anyway!! Sharron can't believe you haven't got a striped dress or two!!! And yes I love the Mint Velvet one, just perfect for throwing on & teaming with a bright cross body bag & denim jacket would the weather not be as great as today!! It's gorgeous isn't it Sarah. Are you tempted?!!! Thanks Keri-Lou yes a fab day if only the weather could be this glorious every Sunday!!! I would honestly love one of each of the dresses I've featured for summer!! Yes I couldn't believe the price of the Pull & Bear one either & love the slouchy design. I think before the end of the summer the contents of my wardrobe might end up looking as if I've got a stripe addiction!!! To be honest I thought I had most dresses sorted in my wardrobe - now I seem to be missing something ...off to investigate further!! Ooh can't wait to see the Pull & Bear dress on your Michelle, I think I'm going to end up with more than one striped dress in my wardrobe too lol!! !